Even though my husband wasn’t very fond of this recipe, I liked it and will definitely make it again. 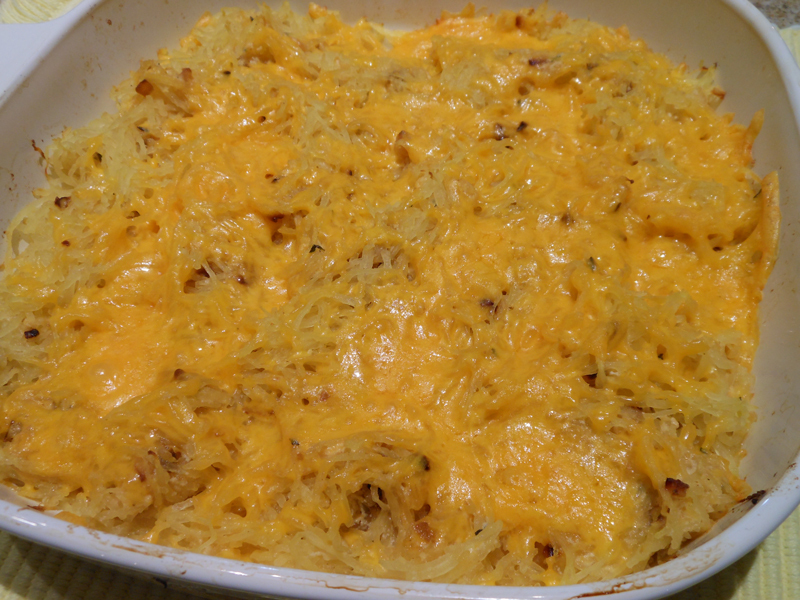 Cut spaghetti squash in half lengthwise and remove the seeds. Spray a 9 x 13 baking dish with cooking spray. Lay squash cut side down into dish. Bake until just tender (the tip of a paring knife can be slipped into the flesh with slight resistance), 25 to 30 minutes. Reset oven to 375 degrees. While squash is baking saute onions, thyme and butter in skillet. Cook until slightly brown in color (I got mine too dark). Salt and pepper to taste. Using a fork, scrape the insides of the squash and transfer to a large bowl. Add the onion mixture, sour cream and half the cheese together and mix well. Pour into a buttered 9 x 13 baking dish and bake at 375 degrees for 20 minutes. Top with the remaining cheese and bake another 5 to 10 minutes until cheese is melted and browning.